I tell y'all, the things we bloggers do to try and get a decent picture: we have more holes than you can count in our walls, we rearrange furniture, we perform gymnastics to get the right angle. And after all that, sometimes the shot still is not quite what we wanted. Thus, this post will also be known as "Where's Waldo, the Christian Cross Version". You see, first I photographed these crosses on the same white wall I staged the last set of rustic crosses on (you can see them HERE). But, I just don't like all that white. So then I tried to hang them on the cedar wall in the solarium, but they blended in too much and there are some less than lovely brass lights on the wall in the way. I decided to try them on the reclaimed wood walls that were in my booth and now sit in my basement. I had to move and prop one of the panels to create a corner so you didn't see the wood splitter. And yes, with reclaimed wood crosses on a wood wall, that is a whole lot of wood to see. But, I decided it was okay, better than the white wall and could provide a little eye challenge game for you. I made 4 crosses with some color this time, and 1 wood one. This wood one was the biggest challenge of the five. I used lathe from our schoolhouse to make the lighter edge with lots of mitered corners. I made a patchwork cross--I have made these before. This cross is made from 2"x 4" wood and grey, weathered, barn wood. Old molding with lots of layers of colors give this cross lots of character. And this one is lovely barn wood, the top pieces painted turquoise. Some friends came over and saw all the crosses I have made and they were concerned we had a vampire problem. I assured them that we were vampire free and I was just prepping for a spring show. But, displaying several of these together would be fun. Clever. I found him but don't want to spoil it for others. I'll give a "subtle" hint though. Photograph cuatro! Ha-ha Deb! It was an afterthought to add him to make it a little fun. 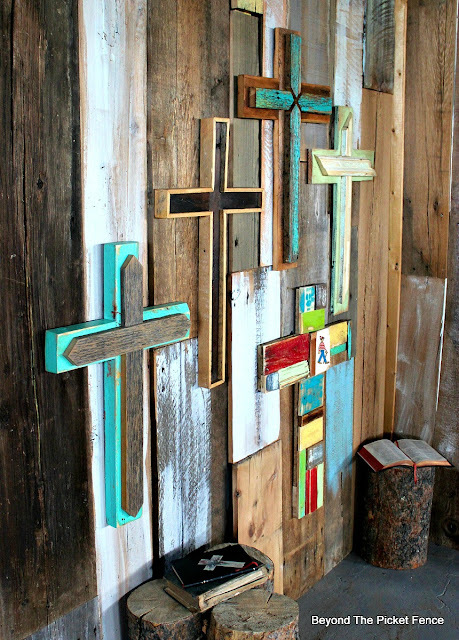 Love the crosses all displayed together, especially on the reclaimed wood wall. Very rustic and eye catching. My favorite is the last cross with the turquoise on top. How fun to add Waldo to a pic, loved those books as a kid! Thanks Audra, it is a lot of wood, but I liked it better than the white wall. I need to paint my white walls, but 12 ft. ceilings are daunting! Thanks Debbie, I had fun making them! I love the turquoise one in the last picture!